How do Magic Tracks work? 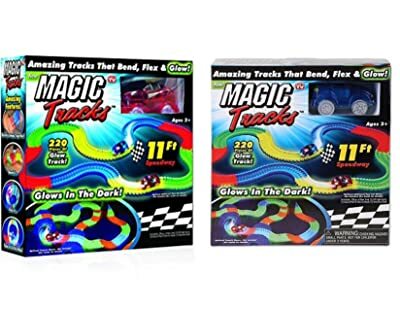 Magic Tracks are colorful tracks that bend, flex and glow. They can be snapped together to form a colorful racing track. It comes with a battery-operated toy car which you can race down the track for a truly entertaining playtime. This battery-operated toy car that comes with the set has 5 LED lights that will continuously blink once the car is turned on. The set also comes with a bunch of stickers for you to decorate it with in any way you like. The tracks also allow you to arrange them in any way you like for a custom-shaped race track. Once you race the car down the colorful track, its blinking LED lights will give the neon-colored tracks a fascinating effect. And since the tracks are glow-in-the-dark, these Magic Tracks is played best with the lights turned off. Magic Tracks comes with 220-piece glow-in-the-dark tracks in 4 colors: orange, sky-blue, yellow, and yellow-green. You should snap these tracks together to create one colorful race track. And since these tracks are bendable even up to 360 degrees, it will allow you to arrange your race tracks in however way you want. The race car that comes with Magic Tracks (red or blue, or both) is battery-operated. You need 3 AAA batteries to make it work. Turning it on will not only make the race car automatically run, it will also make the car’s LED lights to continuously blink. It won’t stop doing so until you turned it off. The race car also comes with a bunch of free stickers. You may decorate your race car with these stickers in any way you want. These stickers allow you to customize your car in accordance to your taste. Once you’re done with setting up your race track and customizing your race car then you’re good to go. All you need to do is turn your race car on, put it on the race track and watch it zoom around the tracks. Since Magic Tracks are glow-in-the-dark, it’s best to play with the lights off. The blinking lights from the race car’s LED lights will give fascinating effect against the neon-colored, glow-in-the-dark race track. The car will light its way along the race track making it look almost magical. Easy to assemble. Even the kids can snap the tracks together and assemble the race track all by themselves. The bendable tracks allow you to flex and curve the track even up to 360 degrees. This allows you to build your speedway however you want. Colorful, glow-in-the-dark tracks. It makes the kids’ playtime, even more, fun and fascinating. It maximizes battery life. A new set of batteries can last up to 8 hours of continuous use. It gives the best result when played with a black light. Since the tracks are glow-in-the-dark, it is a must that you play it with the lights turned off to enjoy its features the most. To enjoy it even more, it is best that you use a black light when playing with Magic Tracks as it maximizes its glowing and magical effect. The set doesn’t come with free batteries, thus, you need to buy them separately. Tracks have the tendency to fall apart easily. Although snapping the tracks together is very easy that kids can do it on their own, the tracks have the tendency to fall apart easily, as well. It’s best to assemble the track in a flat and stable surface, though, to prevent such thing from happening. It doesn’t allow you to build ramps. And again, this is because of the tracks having the tendency to fall apart, easily. Thus, building ramps with your tracks is never advised. Question: Does it come with a carry bag? Answer: No, Magic Tracks doesn’t come with a carry bag. It is boxed. Question: Does it come in 2 separate boxes? Answer: Yes, they come in 2 separate boxes, one with the red race car and another one with the blue car. You can buy them separately or in bundle. Meaning, you have the option to buy both sets at once if you like. Question: Do both cars race each other? Answer: No, these cars come in separate sets. They come with their own race track, as well. And since these are not dual race tracks, it doesn’t allow you to race cars on it. You need to play the cars on separate race tracks. Question: How many pieces per set? Answer: Each set comes with 220 pieces/tracks. If you buy both sets then that gives you 440 pieces all in all. You can connect all these tracks together, however, as mentioned above, you can only play with one race car at a time on a single track. The best way to order your Magic Tracks is through Amazon. With Amazon’s one-day shipping option, you are guaranteed to enjoy your Magic Tracks in no time. This is perfect if you are doing a last-minute shopping for your kid’s gift for an occasion that is fast approaching. Amazon also offers ‘Free Shipping’ for your Magic Tracks order. This will save you a few bucks which can be used for other stuff. With Amazon, you will also see other stuff that customers normally buy with Magic Tracks. These suggestions will give you an option on how to enjoy your Magic Tracks the most. Every kid loves toy cars, even some of the girls. They tend to enjoy it more when played with a race track. However, some, if not most, of the kids tend to get bored with the same toys especially when they had it for quite some time already. This is especially true when the toys they have is not something out of the ordinary. But with Magic Tracks’ really cool features, playing with race cars becomes even more appealing. 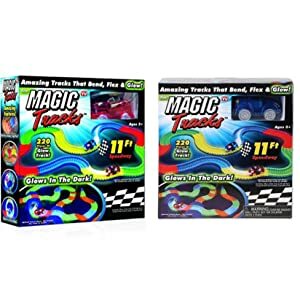 Magic Tracks have all these fascinating features which make it stand out among the other toys. This makes it less boring for the kids even if they had it for quite some time already. This also makes Magic Tracks perfect not just for the kids but to the kids-at-heart, as well. You should buy it on Amazon. See the link in the article.